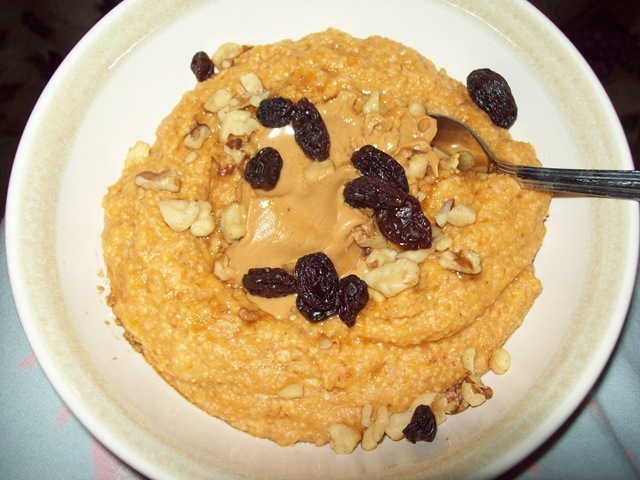 This morning, I was a little on the cool side and pretty hungry (as opposed to yesterday morning) so I made an old favorite…pumpkin raisin PB oat bran. 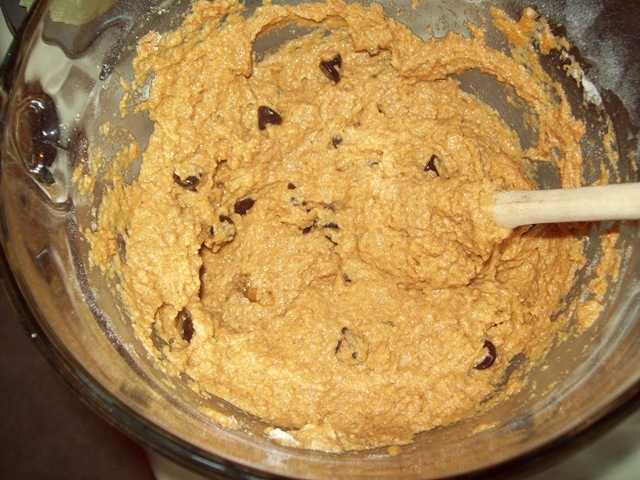 I made this with 1/3 cup oat bran, 2/3 cup skim milk and 1/3 cup water on the stove, then added 1 tbsp toasted wheat germ, pumpkin pie spice and some brown sugar. I also threw some chopped walnuts on top. This breakfast was exactly what I wanted and kept me going most of the morning! I had a Z bar around 11:00, but at 8:44 I had thought I wanted or needed it. So I asked myself that question “Is this hunger or something else?” and couldn’t say for sure, so I kept on working, drank some water and chewed some gum, all which took that feeling away. Have I mentioned how much I love being intuitive?! 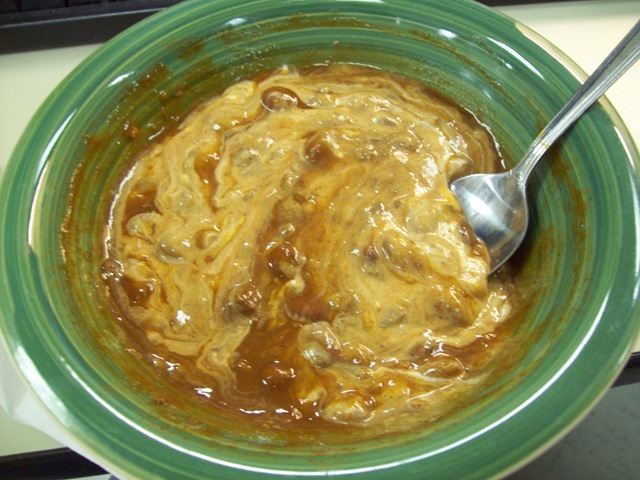 Lunch was a can of Hormel veggie chili with 2 tbsp fat free sour cream. This yogurt was okay but a little too runny for me. But it was cheap this week, so I went for it. My workout was a 30-minute cardio workout. I started out on the treadmill – walked for 1 minute, ran for 8 minutes (5.0,6.0,5.5,6.5,6.0,7.0,6.5,7.5) and then walked for a minute cool down. I love running 7.5 mph even if its only for a minute! Then I did 10 minutes (fat burning program) on the stair master and then 10 on the bike. I like breaking it up because you get to use different machines (and muscles) and don’t get bored as quickly. This workout flew by and I was a sweaty mess! For dinner, I wasn’t sure what I wanted so I took my time, walked the dog and took a shower before I started cooking, which also helped work up a real appetite and not just eating because it’s dinner time! 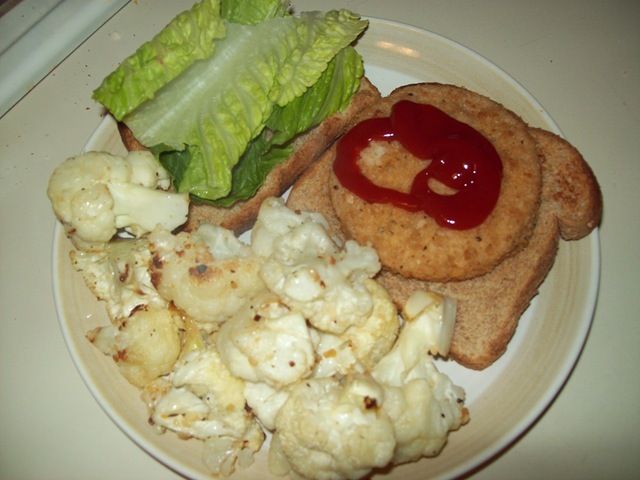 I had a serving with a Quorn chik’n patty on whole wheat bread with organic ketchup and a leaf of romaine. 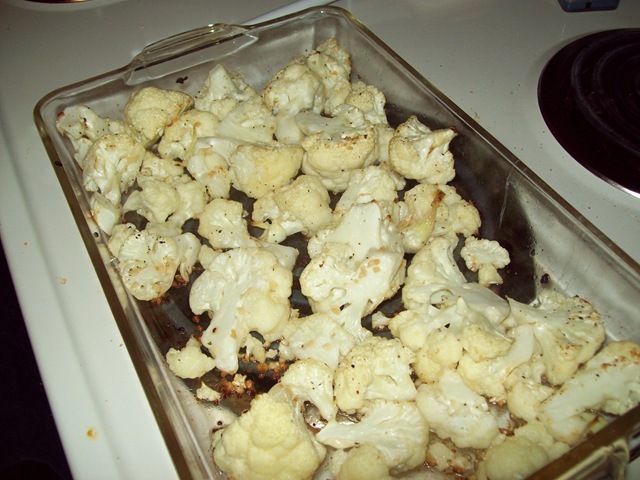 I’m so excited there are leftovers of the cauliflower, it was amazing! Then I took the doggie for a 45-minute walk (the weather is just too nice not to) and then went ahead and baked again! I have dessert for our girl’s night potluck (which is relocating to my house this week!) 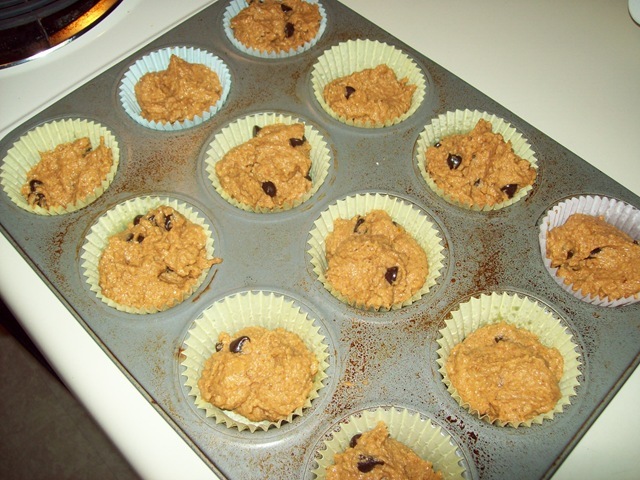 so I went back to another old favorite, Pumpkin Chocolate Chip Muffins! I’ve also been cleaning up a storm to get ready for tomorrow. 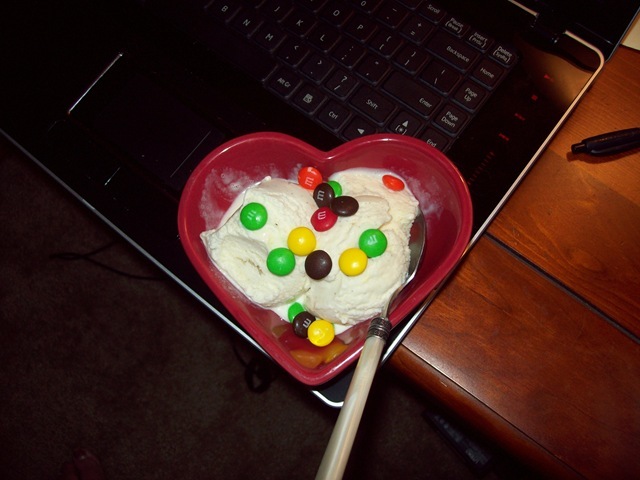 Finally, I sat down to watch Tori and Dean and enjoyed some dessert. I think this weekend I will get some fresh fruit to top the ice cream with so it can be sort of like Ce Fiore (although I get M&M’s sometimes there too, haha). Then after this container is gone, I’m not buying it again for a while. I want it to really be a treat and not a habit. So, enough about me, how was your day? For breakfast, I had a bowl (1.5 cups) of Multigrain Cheerios with 1% milk (1 cup) and 1 medium sliced banana. I was either very tired, hungry, or both yesterday morning because I have no recollection of even thinking about taking a picture of breakfast, oops! I also had a cup of black coffee at work after the gym. The upper body exercises were quite challenging since I had not done them in a week and I increased their reps for the first time! Since I worked out and burned off some calories, I became quite hungry around 10:30’ish and decided to go ahead and have a morning snack instead of that early a lunch or ignoring my hunger any longer. I had this bar on reserve: Planters Big Triple Nut Bar. It tasted amazing! It sort of reminded me of a nutty candy bar only I can’t recall which one because it’s been so long since I’ve had most of them! The nutritionals were okay, this bar comes in at 220 calories, 7 g protein, 3g fiber, unsaturated fat (from the nuts) and 110% DV of Vitamin E. I can’t remember all of the ingredients and can’t locate them on the site yet, but I do remember that this bar DID NOT contain partially hydrogenated anything, high fructose corn syrup, or common artificial sweeteners (that I’m aware of). It was also a great snack…I did not need lunch for two more hours! I would definitely buy this bar again, in moderation, and once the peanut butter scare is over, I would like to try the other flavor, peanut + peanut butter. These bars were in a bin on sale at Kroger, 3/$1. Lunch was another really great sandwich: Hormel natural turkey, 2% cheddar cheese, spinach and mustard on whole wheat bread. Speaking of which, here is the bread I am currently using: Healthy Life soft style 100% whole wheat bread. This bread was on sale this past week at Kroger and I picked it up because it had no HFCS, artificial sweeteners, and fit the 100% whole grain carb criteria. Each 2-slice serving is just 130 calories too, which also helped me out a great deal. I love really thick, dense breads, but those also tend to be calorie dense. I will get them every once in a while, but for sandwiches, I think I’m going to stick to moderate whole wheat bread to keep the calories a bit lower. Next time though, I think I will opt for the non-soft style type. Just a personal preference. I also had some veggies, Green Giant’s Sugar Snap Peas. These were so amazing and I love how you can just throw the package in the micro for a few minutes and voila! These were really sweet tasting and were not drenched in sauce like some other veggies. I ate the entire thing (just over a cup)! I rounded out lunch with a pickle and an orange. It was a very colorful, tasty and satisfying lunch. I have done quite well with lunches this week, eh? I was so thrilled, this meal lasted me 4 hours! I even though about skipping my afternoon snack, but I did start rumbling before I left work so I went ahead and had it so I wouldn’t be starving when I got home. 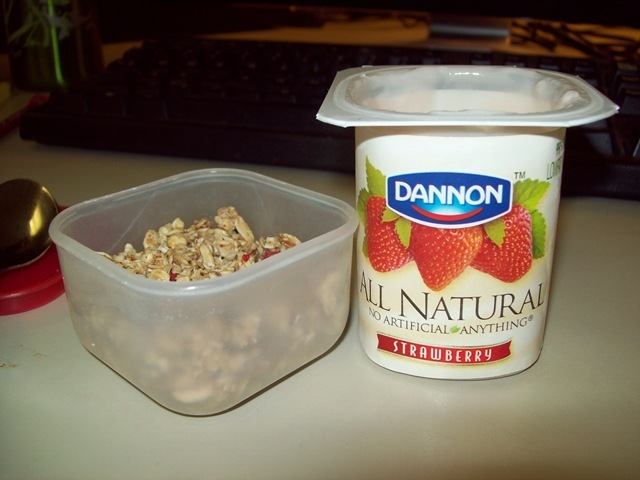 This is major…I think I have had the best yogurt ever, in my life. I love a lot of yogurts but this one really got me. I am almost speechless, this yogurt is absolutely perfect. The consistency and taste were like that of any other greek yogurt. In fact I’d had Fage before, but never with cherry and I believe I got the fat free (0%) kind. I think the 2% is actually better. But oh that cherry flavor. I loved this yogurt so much that I took the tiniest bites possible to make it last longer! I’m also impressed with the nutritionals…just 130 calories, 11 g protein, no fake ingredients! You can view their nutritional statement here. Is that not a beautiful picture (above)? I loved it because it really satisfied me and held me long enough to finish work, go home, walk the dog, and take my time cooking a very tasty dinner! I knew I would be having chicken that I grilled on the George Foreman, but I decided to be different and add some Mrs. Dash Lemon Pepper seasoning. I love the Mrs. Dash line because they are salt free, made from real ingredients, and just a little bit goes a long way for flavor, they also have a big variety. This added a nice touch to my chicken. I also had some steamed brussel sprouts sprinkled with S+P, my other half of sweet potato, topped with cinnamon + fat free cottage cheese, and a slice of whole wheat toast topped with Smart Balance spread. I still wanted something to dip the chicken in, so I checked the fridge and read through the ingredients on our bottle of Habanero ketchup — no HFCS, sucralose, etc. So I had a little bit on the side. This was such a good meal and really hit the spot. After I ate, I flossed and brushed my teeth and sat on the couch with the dog watching the news. After my food settled, I got dressed and went to play volleyball for 1.5 hours! When I got home, I treated myself to a nice bubble bath and then finished a great night off with some chamomile tea and applesauce topped with blackberries, plus some Nip/Tuck with the hubby. I’m feeling really great and blessed this week. Hope you all are too!